In this episode of the TiLT Parenting Podcast, I sit down with Carissa Tozzi and Gena Mann, the creators of Wolf + Friends, a new shopping and lifestyle destination designed to highlight imaginative toys, creative playroom decor, thoughtful style ideas, and inspiring advice that focuses on a child’s physical, sensory, communicative, cognitive, social, and emotional development. What I love about Wolf + Friends, and why I wanted to have Carissa and Gena on the show, is they share TiLT’s vision for changing the way neurological differences are perceived. By bringing their strong sense of design and aesthetics to the site and presenting products for both typical and atypical kids in an inclusive, editorial way, they’re normalizing difference and presenting a powerful online experience for all parents. As you’ll hear from our conversation, it was love at first site for me when I first discovered Wolf + Friends, and I’m excited to share them with you! About Gena and Carissa: Gena Mann (left), Partner + Chief Executive Officer, spent 10 years working as a photo editor for Elle, O, The Oprah Magazine, and CosmoGIRL! 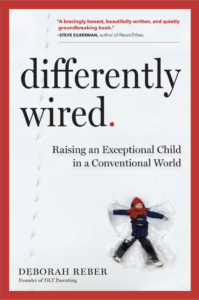 She left magazines shortly after her second son was born and her first child was diagnosed with autism at 2-years-old, moving to Connecticut to create a therapeutic program for her son. Carissa Tozzi (right), Founder + Chief Creative Officer, is an entertainment director, trend forecaster, and brand consultant with more than 15 years of experience in editorial development, celebrity casting, and public relations, working with media and fashion companies such as Refinery29, Seventeen Magazine, Madewell, J.Crew, YouTube, and MTV.